Wulingyuan Scenic and Historic Interest Area is famous for its approximately 3,100 tall quartzite sandstone pillars, some over 200 meters in height. They are a kind of karst formation. Between the peaks lie ravines and gorges with streams, pools and waterfalls, and some 40 caves, as well as two large natural bridges. Remote from the outside world, the site is 85% covered with trees, and 99% covered with vegetation. Wulingyuan, the first national protected forest park of China which most of the Chinese and tourist industry called it after the name of the nearby city, Zhangjiajie, is the world of countless bizarre shaped rock pillars, and, in my opinion, one of the most enchanting landscape that hardly believe to be existed in the real world except in the classic Chinese painting. Located deep in western Hunan, the land of mystery Tujia people, and even today it takes 4-5 hours for travelling from Changsha, the provincial capital, on superhighway to reach this place. The park is very large and has many interesting places; it takes at least 3 days to see all the MUST sites inside the park and nearby. 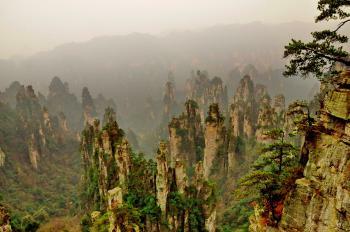 Most of tourists stay in the booming town of Wulingyuan which is located in the middle of the national park. The main attraction of the park is the Yangjiajie Scenic Zone; the area becomes famous after many scenic spots have been used in the film “Avatar” as the planet of Pandora, and you will see many advertisement billboard of the Avatar film in the area especially at the Hallelujah rock (very un-Chinese name), they even have the large statue of bird-liked creature that the Na’vi ride for photo. Apart from the much commercialized area, the scenic is truly wonderful. Tianzishan and Marshal Helong Scenic areas are also worth mentioned. At Tianzishan we need to use cable car to admire the gorgeous landscape of numerous pillar rocks with pine trees (very classic view of Chinese mountain landscape) and at Marshal Helong park, the hundreds of pillar rocks will make the landscape like yoga needle bed! Wulingyuan is not only famous for pillar rocks, the Yellow Dragon cave is also nice to visit with pretty dripstones and underground water boat trip, but thousands of step inside the cavern may kill your knees. To admire some cultural elements of Tujia people who resided in the park, go to Bao Feng Lake and take a boat ride, some area of the lake landscape is breathtaking, but the main attraction is to hear Tujia song that sing by Tujia women who will sing every time the boat passing by. Not part of WHS, the nearby Tianmenshan Park, a large mountain hole that look like a gate to heaven, is also a great place to visit, to reach the summit we need to take 7 kms cable car, claimed to be the longest cable car line in the world and we need to take a bus on the 99 turns road, a great experience for means of transportation. Transportation inside the park is quite interesting; during my visit I used buses, vans, cable cars, electric tram, boats and elevator to discover the place. Wulingyuan is certainly very well developed for travelling, but the entry price is also very high, to visit all attractions may need to spend at least 500-700 Yuan! But all in all, Wulingyuan with its outstanding beautiful landscape and very good tourist facilities is one of the best national parks in China in my opinion, and another great UNESCO World Heritage Site from this country. This site is mostly of karst formations, hundres of them, if not thousands of towers of rock, with dense vegetation covering the towers due to the humidty and temperate weather. As opposed to Arches in Utah, where the dry weather kept the rocks red and bare. Do bring a wide-angle lense of 18mm minimum, telephoto of 200mm and and polarizing filter for the waterfall with your camera. Cable cars and well laid out paths allow you to see most of the sites. It could get monotonous after 2 days, though. Due to lower elevation climbs and walks are not demanding asin Huanglong or Jiuzhaigou, the other two more sites in the region. There is now a direct flight from Hong Kong, so you can be spared of the long drive from other provincial cities, if you have no interest in them. As it is just being developed as a tourist area, accommodations, especially restroom facilities in restaurants are primitive, and can be turn-off to US or EU visitors. Besides the national park, there is also interesting local ethnic minority villages and customs to take in. 4.0: Joyce van Soest Zoë Sheng Vicente B. Avanzado Jr.